Not just indulgent but essential for skin revitalisation and rejuvenation. Transform your skin with a SKN-RG Organics facial, the brand of choice, where you can see the results for yourself! Created using the very latest natural science to lift, plump and firm, while reducing irritated and sensitive skin, these age defying products use herbal complexes which can powerfully enhance and enliven your skin on a cellular level. The finest and natural ingredients are at the heart of SKN-RG Multi Award Winning High-Performance Skincare, which is certified organic by The Soil Association and Leaping Bunny Cruelty-Free meaning you will be receiving a truly high calibre professional facial. For optimum results the recommendation is every four weeks in line with cell renewal for continued revitalisation, rejuvenation and hydration of skin. 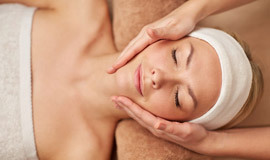 This is a soothing, non-surgical, gentle and relaxing facial that is different from any other! Using Natural Elements products together with the Iontophesis microcurrent touch vibration to penetrate nutrients deep into the multiple layers of the skin which stimulates collagen growth, this treatment helps reduce wrinkles, puffiness and dark circles, so you can prep to look your best! To enhance a fresh and vibrant complexion the treatment also incorporates a cooling Jade Roller, (Jade has healing properties for anxiety, fatigue and protects against negative energies), and a Head Massage – all designed for total relaxation and to revive, refresh and rejuvenate your tired eyes! This treatment takes 30 minutes and is ideal before a special occasion, wedding, party etc. For optimum results and an intensive course the recommendation is one a week for four weeks and then monthly.